The region of central Italy is worldwide famous for its authentic flavors and the manufacturing luxury sports car and motorcycles. But Emilia Romagna is more than home-made fresh Pasta, Parmigiano Reggiano, Aceto Balsamico di Modena; it’s a place to discover for its culture: an extraordinary treasure trove of art and history. 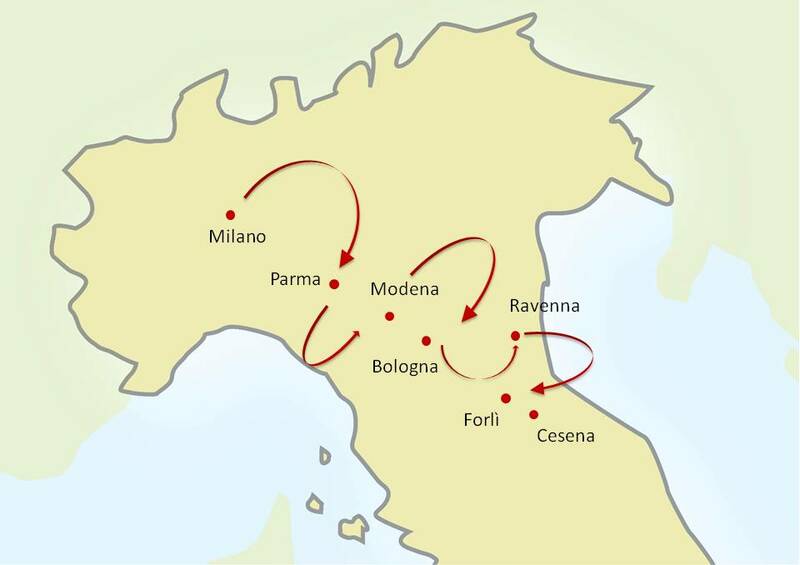 The tour features Parma, Modena, Bologna, Ravenna and Romagna countryside. Bologna, the fat goes hand-in-hand with so called Bologna, the learned: the capital of the region is not just hand-made pasta (tortellini, lasagne, ravioli, tagliatelle) and ragù alla Bolognese. The world’s first university was established between its walls in the 11th century and the charming old town centre bears witness to the cultural importance of Bologna over the centuries. The name of Parma is linked to its excellent ham, the Prosciutto di Parma and the famous Parmigiano cheese; but don’t forget that this elegant city is the capital of opera: Niccolò Paganini, Arturo Toscanini and Giuseppe Verdi were born here and honored by the historical Theatres of the city. Modena is worldwide known for its Aceto Balsamico: tasting and paired with this unique dressing are unmissable. The area is also famous as “Terra dei Motori”, homeland of two of the most popular Italian Motor Racing Cars: Ferrari and Lamborghini. Ravenna is extraordinary rich in art, history and culture: its basilicas and baptisteries still house a wealth of mosaics dating from the 5th/ 6th centuries AD and eight monuments of the city are UNESCO World Heritage Sites. Last but not least: discover the countryside and taste the typical wines of region- best selling wine estates of Italy. Learn how to cook typical local dishes at Casa Artusi, the first centre of gastronomic culture devoted entirely to Italian home cookery. 8 Nights accommodation in exclusive and fascinating 4/5 stars Hotels or Wine Resorts, with full buffet breakfasts: 2 Nights in Parma, 4 Nights in Bologna and 2 nights in Romagna. Private sightseeing walking Tours with expert local English speaking Guides, including the entrance fees to the sites visited: Bologna (Teatro Anatomico) and Ravenna (Mausoleo di Galla Placidia, Basilica di San Vitale, Basilica di Sant’Apollinare in Classe). Visit a famous producer of Culatello di Zibello (the unique and most refined expression of Parma Ham) and other Salumi, light lunch included with Salumi, Parmigiano, Focaccia and wine. Typical Lunch in a refined Restaurant in Modena. 1 Lambrusco winery visit and wine tasting. 1 Sangiovese winery visit and wine tasting. Full-day excursion to the Italian food valley: small group Tour with minivan and English speaking food guide to visit parmesan Cheese, ham and balsamic Vinegar producers (tastings and lunch included). Cooking experience at Casa Artusi – the centre of gastronomic culture dedicated to Italian home cooking – Lunch included. Entrance tickets to Museo Casa Enzo Ferrari. Tour begins in Milan and ends in Bologna (it can be operated also starting in Bologna and ending in Milan). Explore the capital of good food and opera, Parma: the Cathedral Square with its ‘pink marble’ Baptistery and the Cathedral Dome decorated with frescos by Correggio; if you are interested in music not to be missed the historical Theatres: the Farnese Theatre, a copy of Andrea Palladio’s Teatro Olimpico in Vicenza, situated inside the Palazzo della Pillotta and the Regio Theatre, symbolic venue of Giuseppe Verdi’s music. Parma is not only famous for its “Prosciutto” (ham), Parmigiano cheese, architecture and music but also for its surrounding countryside. Full-day excursion to Parma countryside to visit a famous farm where “salumi” are produced. Visit the old “Corte” and one of the best producers of Culatello di Zibello, the unique and most refined expression of Parma Ham to discover the secret of its production and seasoning. Tasting included. Stop in Modena, “la Terra dei Motori” homeland of the most popular Italian Motor Racing Cars: Ferrari and Lamborghini. Visit the famous MEF (Museo Casa Enzo Ferrari) displaying the most noteworthy automobiles in Enzo Ferrari’s life as a driver and car builder (Ferrari, Alfa Romeo and Maserati cars), rare cars of the 1950s, Formula One race cars. The museum takes visitors into a magical time machine that spans his whole life and immerses them in the history of the 20th century. We could also arrange a stop in Maranello where you will have the chance to drive a real Ferrari! You'll pick-up your fantastic car (Ferrari 430 or Ferrari California) and drive it in the afternoon, exploring the surroundings of Maranello. Don’t miss the Ferrari Museum of Maranello, custodian of the myth the Company’s official exhibition housing cars and trophies that have characterized the history of the brand and have been hugely successful on commercial markets and worldwide circuits: one of the reasons why the museum is not just a static collection but a dynamic exhibition constantly renewed. (OPTIONAL). Lunch in a refined restaurant in Modena to taste typical fresh pasta and typical dishes with the local traditional balsamic vinegar. You will appreciate the creativity, unique in terms of the marriage of textures and flavors that come from the region: the cuisine tries to combine both tradition and touches of creativity which translate in successfully revisited dishes. Visit a winery of Lambrusco di Modena where you have the chance to taste one of the best-selling wines of Italy. Private guided tour of Bologna, plenty of works of art bearing witness to the cultural importance of the main city of the region over the centuries. A walk under the almost 40 km of porticoes that adorn its streets mean visitors can enjoy city life and its gastronomic fame. Guided tour of Ravenna, a city with ancient origins and a glorious past, three times a capital city: of the Western Roman Empire, of the Empire of Theodore (King of the Goths) and of the Byzantine Empire of Europe. Its basilicas and baptisteries still house a mosaics from the 5th/ 6th centuries AD and eight monuments of the city are UNESCO world Heritage Sites. Full-day excursion to the ‘Italian Food Valley’, from where some of the best world popular Italian food products come from. Visit the best production farms with an expert local food guide: a small organic factory of Parmigiano Reggiano DOP where you will have the rare opportunity to witness the entire process of the production. Breakfast with Parmigiano Reggiano cheese and fresh ricotta with a glass of sweet Lambrusco. Then a local Modenese family will show you the ancient technique of aging local wine in oak barrels to produce the famous Aceto Balsamico Tradizionale di Modena DOP; full tasting of Aceto Balsamico Tradizionale DOP. Lunch in a countryside “trattoria”, and then visit one of the best Prosciutto di Modena DOP producers in the region, one of the most delicious pork products this planet has ever known. Sangiovese winery visit with a guided tour of the cellar and tasting in a beautiful winery in the Romagna countryside. Cooking class experience at Casa Artusi, the first centre of gastronomic culture devoted entirely to Italian home cooker founded in the name of cultured gastronomist from Forlimpopoli, Pellegrino Artusi, author and restaurateur and recognized father of the Italian cooking. Visit the famous cultural center dedicated to home cooking Italian cuisine and attend a practical course (hands-on-cooking class) for preparing traditional Italian menu, using top quality ingredients. Some of the most important names in national catering liaise with the Cookery School and Casa Artusi asks professional teachers to coach course participants using their knowledge of domestic cookery: many of them are Michelin-star, but we like to call them “Maestri di Cucina” (Masters of Cuisine).